The American Legion Department of Arkansas is promoting The American Legion’s centennial birthday, creating brand awareness and recruiting new members statewide all through free billboard advertisements. Department Public Relations Chairman Keith Dover contacted the Department of Connecticut to receive a copy of the billboard design they created a few years ago. From there, Dover and his son-in-law, Shane Ross, developed a design for the state of Arkansas. 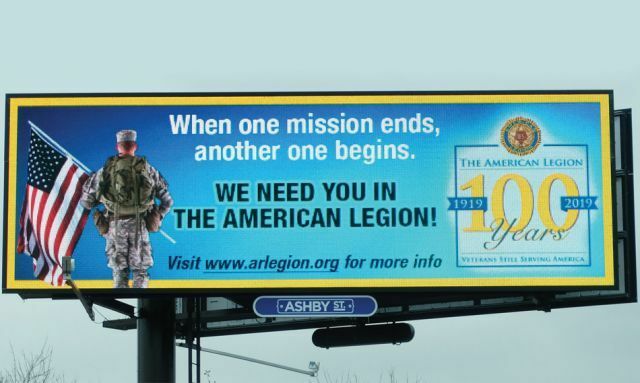 The message mirrors Connecticut’s, “When one mission ends, another one begins … We need you in The American Legion,” features the Legion’s centennial logo and directs visitors to the department’s website. Dover contacted Lamar Advertising and they agreed to run the design on three of their largest electronic billboards at no charge and offered placement on regular billboard signage statewide that wasn’t already being used. Dover contacted Ashby St. Outdoor Advertising in Fayetteville, and they too offered to run the design on four electronic billboards at no cost. The billboards are live statewide.